For those of you who do not Nouriel, you must, I am sorry to say.. have your head in the sand. 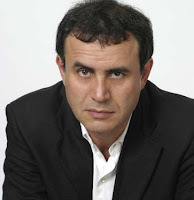 Nouriel, or “Dr. Doom” as the press has chosen to call him, is an NYU economist and head of RGE Monitor, that has become famous for having been right on for years about what is going on in our economy. I had the pleasure last fall of attending a small group dinner with Nouriel following a discussion with him, George Soros and Jeff Sachs at Columbia University and let me tell you this is one smart and practical dude. I have since become a paid subscriber to his economic information and it is exceptional. I just finished reading an interview with him in this weekends journal and it is a must read. He calls to “‘Nationalize'” the Banks” and though I personally am not sure that is the right thing to do, I trust this guy has done his homework and sees it as the only solution. In the interiew he says this – “Between guarantees, liquidity support, and capitalization, the governement has provided between $7 trillion to $9 trillion of help to the financial system.” Though that is mind-blowing, the sad reality is that we are no where close to done. No where close. The government must take some action that gives the world some sense that they know what the heck they are doing. So far, in my opinion, the new administration has failed to deliver. If you want an idea of what a healthy banking system looks like just look north of the border to Canada. Take a look at this FT piece “Canada Banks prove envy of the world” for the right long term model.